This unique clock was made using old teacups. Upcycling is a great way to introduce vintage wares into modern designs. Whether working with broken pieces, or simply displaying grandma’s collection differently, this method of recycling items is quite popular. At Manolo for the Home, you’ll find ways to repurpose old teacups. 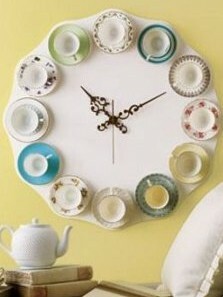 Our favorite is this teacup clock, but there’s some other great designs, like a teacup chandelier or teacup sconce. We’re sure these ideas will spark even more creativity. The great thing about these pieces is you don’t need a full, matching set. With a few dollars and a trip to the local thrift store, you could easily find enough pieces to make many different items for the home. If you take up the challenge this weekend, we’d love to see your finished project.